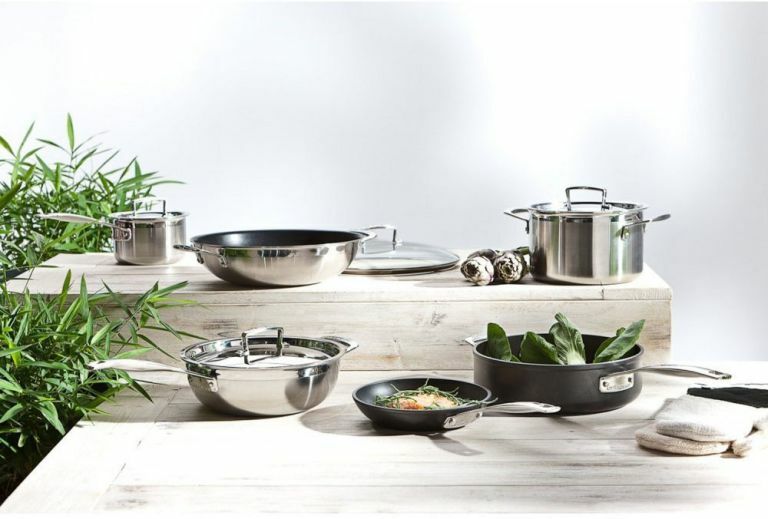 Whether you’re a Jamie Oliver-style kitchen wunderkind cooking on all four burners, a first-time cook just learning the ropes, or anything in between, there’s one thing that every home cook needs, and that’s a trusty set of saucepans. The initial outlay might seem off-putting, especially when the price creeps into triple figures, but buying a set of pans in one go can often mean saving money in the long run. If this isn’t your first foray in the world of buying cookware, you might have seen a few materials mentioned, and wondered exactly what it is they’re all for: well, wonder no longer! Hard-anodised pans are a popular choice, with the superior conductivity and lighter weight of aluminium, but treated with a hard finish that won’t chip, peel or react to acid in food. They can be expensive, but they last exceptionally well. Stainless steel isn’t the best conductor, and may suffer from hot spots, but it’s incredibly durable and easy to clean, so it’s a great investment for pans that you want to last a lifetime. Finally, there’s the size of the set. If you’re a student just starting out, or taking the first step on your voyage to TV chef superstardom, three will probably cut it. If you have a little more to spend and are planning on cooking a wider range of dishes, it makes sense to get a set of five, which will often include a frying pan and a milk pan for making sumptuous sauces. If you think that all saucepans look much of a muchness, then think again. Presenting the Morphy Richards Special Edition Pan Set, rocking a matte finish in beautiful pebble grey and contrasting shades that are sure to stand out in your kitchen cabinet. With 16, 18 and 20cm saucepans and a useful lidded frying pan, this high-grade stainless steel and tempered glass set is durable as well as good-looking. These professional-looking pans will give you years of faithful service, and look darn good while doing so. Le Creuset pans are a household name, and with very good reason: they’re durable, beautiful, and if we’re being totally honest, a total kitchen lust-have for you to show off to your friends. These ones are no exception, with quick and responsive heating, metal-safe non-stick coating, an oven and dishwasher-safe finish, and lovely, subtly branded hardware. For big and busy families, or enthusiastic cooks without a lot of shelf to spare, this Tefal Ingenio set is a space-saver as well as a weeknight sanity-saver. The detachable Ingenio Bakelite handle can be attached securely with a single click onto the pan of your choice, leaving the unused pans to nest neatly in the cupboard, no awkward fixed handles to work around. The versatility doesn’t stop there though: these pans can be used on all hob types including induction, in the oven, at the table, in the fridge, and finally, in the dishwasher. Truly remarkable stuff, with a remarkable price tag to match. This budget saucepan set from Argos comes in at under £20, but feels much less flimsy than many of its low-priced rivals, making it a great first saucepan set for students, starter homes or infrequent home cooks. With their aluminium construction, these plans are light to lift for serving or draining, and offer quick and even heating for guesswork-free cooking, while the strong tempered glass lids feature steam vents to prevent unwatched liquids boiling over. These copper-finish Cooksmark pans will look the part in any vintage-style country kitchen, or add a touch of warmth to a modern minimalist pad. The satin-finish exterior is durable and scratch-resistant, and the aluminium construction heats evenly and resists warping — so not only do they look timeless, they’ll keep going, too. The ceramic coating is a nice alternative for those who aren’t comfortable with the alleged health implications of traditional non-stick. This induction-safe hard anodised pan set is versatile enough to handle any kitchen task you can throw at it, without commanding the high price tag of its equally useful competitors, making it a great value set for enthusiastic home cooks. It comes with a 14cm milkpan, ideal for sauces and hot chocolate, and a frying pan for starting off flavourful bases. For frequent and varied from-scratch cooking, this is a truly excellent buy.